Providing a great user experience is always the goal, and the best way to achieve that is by having a well-thought-out digital business continuity strategy. You can’t always know what type of disruption you’ll face next, but you can be sure that there will be one. It may come in the form of a broken connection but, even more likely, the availability of the application or host. 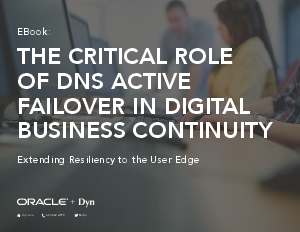 DNS active failover ensures real-time failover to healthy endpoints, allowing you to extend your business continuity solution to the user edge.